Would you like to learn how to make simple cheesecake recipes that can be turned into luscious fancy ones. By adding a few extra ingredients to plain recipes they will be suitable for entertaining and parties. In the first recipe I will show you how to make a simple cheesecake recipe made with brown sugar; it is a crème brulee cheesecake recipe. Crème brulee or “burnt cream” has been around for hundreds of years. It is so popular that many countries try to claim the fame for this luscious creamy dessert. The popularity of this dessert comes from the burnt sugar taste or caramel taste. The original dessert gets this flavor by adding vanilla and torching a sugar topping. The deep dark brown sugar in this recipe turns one of my simple cheesecake recipes into a wonderfully flavored dessert without the fire. The great vanilla flavor typical of the traditional crème brulee is obtained by the large amount of vanilla in the recipe; a good quality of vanilla is very important for flavor. The combined flavors of the cream cheese filling and the sour cream topping make this dessert special enough for any party. 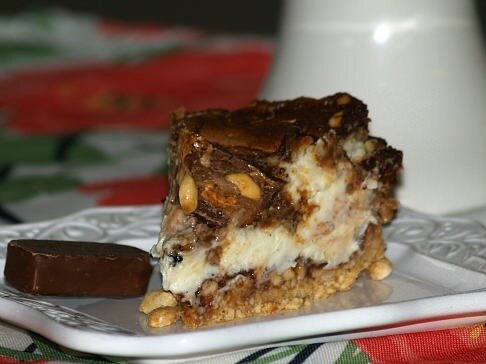 For the second recipe I will show you how to make a simple cheesecake recipe and with the help of candy bars I have made a Snickers cheesecake recipe. Who doesn’t love Snickers! 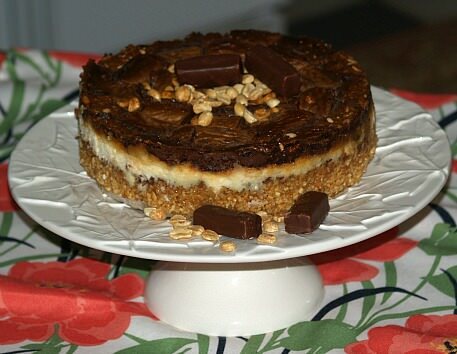 The same will apply when you try this delicious creamy Snickers cheesecake. I used a peanut crust to bring out the peanuts in the candy bars; you can use whatever is your favorite. This simple cheesecake recipe is made from a dark brown cheesecake recipe giving it a rich caramel flavor. Preheat oven to 350F degrees; wrap bottom and sides of 9 inch spring form pan with solid sheet of foil. Combine vanilla wafer crumbs with melted butter; press in bottom and 1 inch up sides of pan. Combine cream cheese and ¾ cup brown sugar; beat on medium speed until creamy. Add whole eggs and 7 egg yolks one at a time beating well after each addition. Blend in 2 tablespoons vanilla; pour batter in prepared spring form pan. Set spring form pan in larger pan; add hot water about one inch up sides of pan. Set in oven and bake 1 hour or until center appears almost set. INCREASE OVEN TEMPERATURE TO 375F degrees. To make topping combine and beat 3 egg yolks, ¼ cup brown sugar and 1 tablespoon vanilla until fluffy. Beat in sour cream; remove cheesecake from oven and spread topping over the top. Return cheesecake to oven (WITHOUT LARGER PAN AND WATER) at 375F degrees and bake for 30 to 35 minutes until top is browned. Turn oven off, open oven door slightly and let cheesecake set in oven until cooled. Remove cake from oven and remove foil from around pan. Cover and refrigerate about 8 hours until cold. This simple cheesecake recipe is a plain vanilla; it takes only the candy bars to turn it into a Snickers recipe. Wrap bottom and sides 9 inch spring form pan with solid sheet of aluminum foil. Combine peanuts and melted butter; press in bottom and 1 inch up sides of prepared pan. 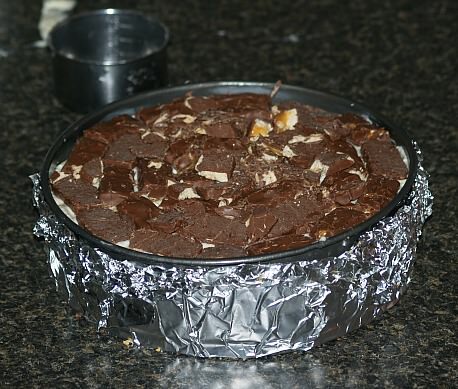 Cover top of peanut crust with slices of Snickers bars; set aside; save remaining for top. Combine cream cheese and 1 cup of sugar in large mixing bowl; beat on medium until creamy. Add eggs one at a time beating well after each; add cream and vanilla and beat until mixture is fluffy. Pour batter into prepared pan over top of sliced Snickers bars. Place spring form pan in larger pan; fill with hot water 1 inch up sides of spring form pan. Set both pans in oven; bake about 80 minutes. Remove cheesecake from oven; remove ALL foil. Let cool to room temperature away from cold drafts; cover and refrigerate until cold. Run knife around sides to loosen cake from pan; remove sides of pan to serve. This simple cheesecake recipe is a basic cinnamon spice and the added walnut, phyllo dough and syrup turn it into a baklava simple cheesecake recipe. Beat cream cheese in large bowl on medium speed until creamy; add sugar and beat until smooth. Add eggs one at a time beating after each addition; add lemon extract and beat until fluffy. Set aside while preparing spring form pan. NOTE: When working with Phyllo dough keep covered with damp cloth to prevent drying. Cut all but two sheets of Phyllo dough in circles to fit 9 inch spring form pan. NOTE: You can butter all the sheets first, fold them in half and cut circles all at once. Reserve scraps and keep covered with damp towel. Brush melted butter on bottom and sides of pan; set aside. Lay 1 remaining whole sheet of Phyllo on wok area; brush with melted butter. Fold sheet over in half making square; brush top with melted butter. Lay remaining 1 sheet of Phyllo on work space; brush with melted butter. Fold sheet in half making square. Place second square evenly on top of first square and brush top with butter. Lift square into buttered spring form pan pressing in the bottom and against the sides. Arrange scraps of Phyllo dough in bottom of pan buttering each. Sprinkle thin layer of nut mixture over the top. Stir cheesecake filling and pour over top of the Phyllo dough in prepared pan. Lay cut circle of Phyllo dough on work station; brush with butter and sprinkle lightly with nut mixture. Continue with remaining cut circles brushing each with butter and sprinkle with nut mixture. Stack each circle on top of each other; with sharp knife cut wedges for cheesecake pieces. NOTE: Do not cut quite all the way through into 12 to 16 wedges. When finished lift pile of circles on top of cheesecake filling. Bake for 60 to 75 minutes; if Phyllo get too brown, lay sheet of foil over top. Remove from oven to cooling rack; cool to room temperature. Before serving cook syrup and let cool; remove sides of pan and pour syrup over cheesecake top. To make honey syrup combine all ingredients; bring to a boil and cook for 20 minutes or until thickened. Remove lemon, cinnamon stick and cloves before pour over cheesecake.